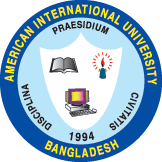 The Department of Public Health of American International University-Bangladesh (AIUB) organized a day long workshop and seminar for physiotherapists with the title 'AIUB MPH Daylong Workshop on Musculoskeletal disorders in the workplace including low back pain- prevention and treatment' on Friday, 15th of January at the AIUB auditorium. Prof. Dr. Tofazzal Hossian (vice President, Academics) and Prof. Dr. Tazul Islam (Dean, Faculty of Arts and Social Sciences) declared the opening of the workshop with the presence of Dr. Mohammad Sadiqur Rahman (Director, Central Police Hospital) as the special guest. The key speaker of the program was Dr. Valerie Ann Taylor (founder and coordinator, CRP). After her introductory speech Dr. Valerie Ann Taylor showed everyone one of the great creations of CRP that is the balance tool which is a sitting arrangement made by CRP. Professor Md Sohrab Hossain then carried on with the workshop and taught the participants various dimensions of physiotherapy. The workshop ended with a lively question and answer session for the enthusiastic participants. This was followed by an interactive session on motivation and guideline to build up a career where the participants were divided into 5 groups. After the lunch and prayer break, the program again started to gain its momentum as the seminar section was carried out by Abu Muhammad Musa and Dr. Md. Azizul Islam where the participants were informed about the scopes and benefits that's a Masters in Public Health brings to the physiotherapists and how they can build up a career in the public health field coming from such a background. The wonderful day long program ended on a high note with the prize distribution ceremony where prizes were given to the quiz contest winners handed over by Prof. Dr. Tofazzal Hossain, Vice President, Academics, Prof. Dr. Tazul Islam (Dean, Faculty of Arts and Social Sciences), Mr. Manzur H Khan, Director, Student affairs and Dr. Md. Aurangzeb, the key organizer of this program. The entire program was organized and coordinated by MPH Faculty Dr. Md. Aurangzeb. The Department of Public Health humbly acknowledges the generous support extended by the AIUB management and especially the Office of Student Affairs (OSA) to make this program a grand success.